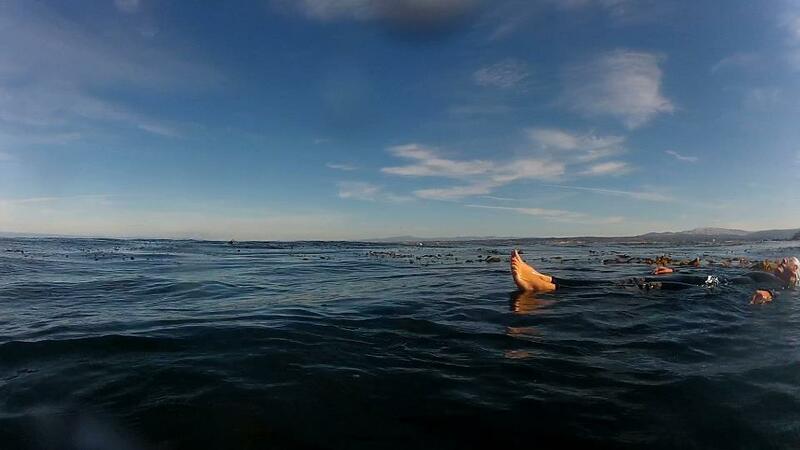 On Sunday I went swimming in the Monterey Bay with my open-water swim group. I went out with a couple of friends and as we swam, I noticed the water was moving more usual. There was a bit of a swell, something I haven't experienced for a while, and it was making me a little uncomfortable. That feeling, paired with a knowledge that I was sore from a hike the day before and not feeling 100%, made me decided to turn around after a third of a mile, cutting my swim a bit short. My two companions wanted to swim further, so I started back solo. 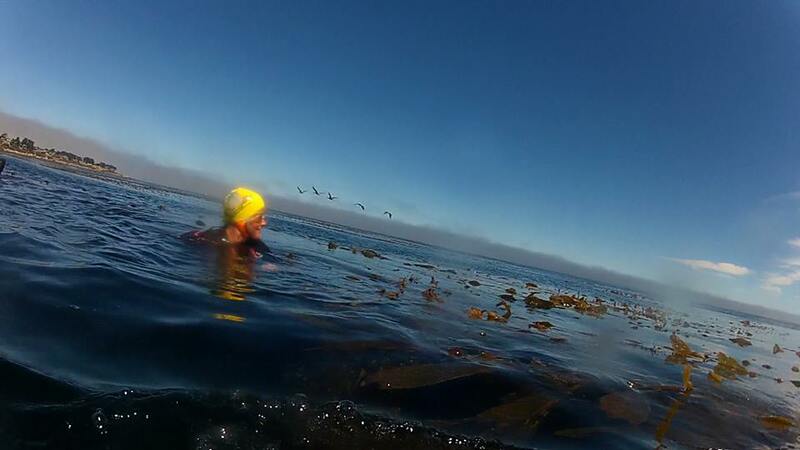 A low-grade anxiety started in as I swam-- nervousness about being alone, about current, about sharks, even hyperaware of a strand of kelp in the murky distance looking like who-knows-what. The feeling of anxiousness would swell and recede, swell and recede, mixed with thoughts about the sweet sunshine, the sunlight on the ripples of the water. Today marks one year since my dad died. Since my dad died, I have been much more anxious in the water, much more apt to skip a swim, but lately I've been coming more regularly. Out there in the water on Sunday, I thought of a story that my mom told me on the phone last week. When they were first married, before I was born, my dad took my mom on a hike. The hike ended up being much longer than at least my mom expected, with patches of steep climbs. My mom had felt like giving up, but my dad helped her through, even carrying her on his back at the end. Not so long after thinking about that, I saw a school anchovies swimming underneath me-- thousands, ten of thousands (millions?) of them. I was amazed and thrilled to be swimming with them, and this feeling, too, lasted for a few moments. Then every ocean documentary that I've ever seen flashed through my head and I imagined SOMETHING bursting up through the school in search of food-- a lunge-feeding humpback, a dreaded Great White, even a harbor seal-- careening up for a mouthful of anchovies and ending up with a mouthful of me. I began to "swim fast," which is actually just thrashing more, to try to swim away from this beautiful food-source. Stroke after stroke, and still the carpet of anchovies underneath me continued. Stroke after stroke, on and on, and finally there were no more anchovies, and I was well within my familiar cove. That swim seems to me like a miniature model of life. Anxiety crescendos and decrescendos; joy alights and then flies away. Grief goes on and on; overtaking me for a time and then lying low. Those anchovies are still out there somewhere in the ocean; sometimes they're all I can see, and sometimes the water is clear. Things come and then they go. As I rode my little scooter home from the swim, the sun shone on my salty arms and the breeze fluttered my clothes. I felt light. Today on this anniversary, I feel heavy. I feel the weight of the last year hanging on me. I remember my dad with joy and with deep sorrow, and I still feel anger and dismay that he is gone. An ocean of feelings, beautiful and terrible. Like the tides, things come and then they go.